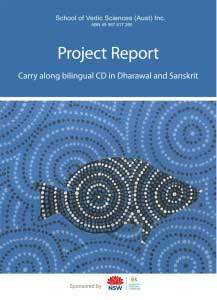 Carry Along Bilingual CD in Dharawal (Aboriginal Language) and Sanskrit sponsored by the government through the NSW Community Relations Commission was conceptualised to promote intercultural understanding between Sanskrit language speaking community and the native Dharawal community. This is aimed to be achieved through identification and translation of the commonly sung cultural songs/hymns available in Dharawal language into Sanskrit. Record the songs in an audio format that can be transmitted through CD, website etc. Release the CD and booklet in a major cultural event organised by School of Vedic Sciences. Dr Meenakshi, as the subject matter expert in Sanskrit has been the creative source in translating the Dharawal songs into Sanskrit. As part of this project, she has also written the ‘Ode to Australia’ song that has been well acclaimed by the community in and around Sydney. In Samskrutotsavam 2012, an Indian classical performance by Smt. Aruna Gandhimathinathan depicted ‘Dharawal – The story of the Dharawal speaking people of Southern Sydney’. This unique concept conceived by Dr Lakshmi Satyanarayana was very well received by the audience.